The Great Nebula in Carina is the showpiece of the southern hemisphere, larger than the Great nebula in Orion in appearance. Its distance is estimated to be 6500 to 7000 light years and it shows beautiful and intricate structure in small telescopes. The region also contains several open star clusters (e.g. Trumpler 14 and 16). Trumpler 14 is only about one-half million years old. Near the center of the image is the star Eta Carina, a hygergiant star with a luminosity some 4 million times more than our sun. Technical. This image was obtained with a stock Canon 7D Mark II 20-megapixel digital camera and 300 mm f/2.8 L IS II lens at f/2.8 and ISO 3200. No dark frame subtraction, no flat fields. Tracking with an Astrotrac and no guiding. Forty three minutes total exposure (86 30-second exposures). This image is a crop to show detail in the main nebula region. The image is shown at 2/3 full resolution, 4.2 arc-seconds / pixel. This image was obtained with My Very Portable Astrophotography, Landscape and Wildlife Photography Setup. This image was obtained from the 9200 foot level on Mauna Kea Hawaii. 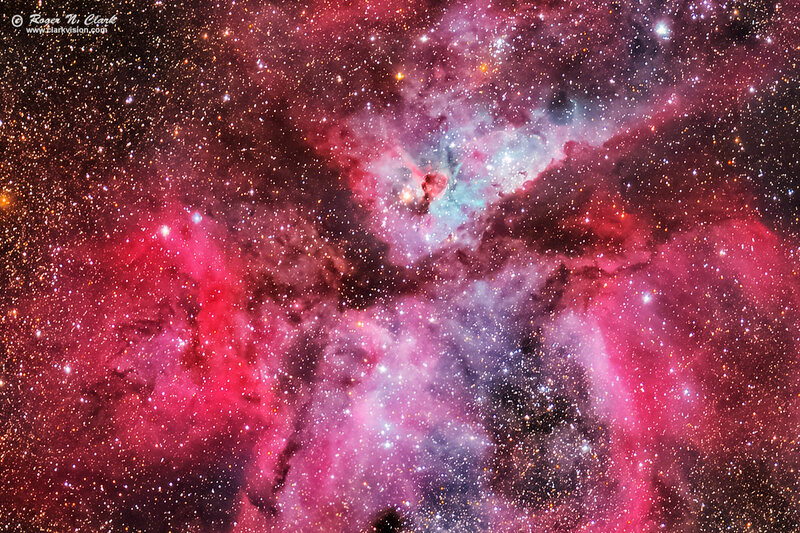 At this latitude, 19.75 degrees north, Eta Carina is low in the sky. Over the time this image was obtained, the nebula rose from about 8 degrees altitude to a maximum of about 10 degrees. But it was low in the sky in the direction of the erupting Kilauea volcano which was covering the island with considerable haze. To add to the difficulty, it was breezy, causing shake to the system, so I elected on the higher than usual ISO and shorter exposure times. Despite the haze, wind, and low altitude, the image came out better than I thought it would. This is a natural color image. The high dynamic range of astrophotos must be stretched to bring out the range of details the camera recorded. But the typical image stretch process loses color for brighter subjects (e.g. stars and the brighter parts of deep sky objects become whiter as they are made brighter). This image uses a new algorithm that does not lose color during the stretch. The new algorithm enables fainter details to be shown and with less noise. Learn about the new software and download it free (open source) here: rnc-color-stretch. Post processing: stretched with rnc-color-stretch. Also see Astrophotography Image Processing Basic Work Flow. This image is a result of 3 runs of the stretch tool and assembled with the brightest sections with the least stretch and the faintest the hardest stretch in order to show the full dynamic range. CEFA = 30300 minutes-cm2-arc-seconds2 (2.8 arc-seconds / pixel). Modern DSLRs like the 7D Mark II include on sensor dark current suppression and low fixed pattern noise at ISOs around 1600 and higher, making no need for dark frame subtraction. Modern raw converters correct for light fall-off and also correct for hot/dead/stuck pixels. This makes processing low light images easy: simply align and average. See my review of the Canon 7D Mark II and why it is so good for astrophotography: Canon 7D Mark II sensor analysis.